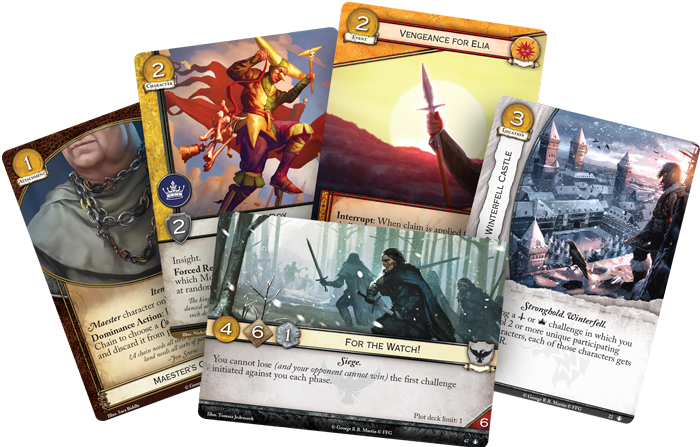 Fantasy Flight Games is proud to announce Taking the Black, the first Chapter Pack in the Westeros cycle for A Game of Thrones: The Card Game Second Edition! As A Song of Ice and Fire begins, King Robert Baratheon rides north to visit his old friend Eddard Stark in Winterfell. Westeros is at peace. But this deceptive calm will not long remain. Already, the seeds of unrest are growing with the ambitions of House Lannister, with the wedding of Daenerys Targaryen to a Dothraki khal, with the apparent murder of the Hand, Jon Arryn. Conflict between the Great Houses looms on the horizon as the high lords and ladies of Westeros begin to play their game of thrones. 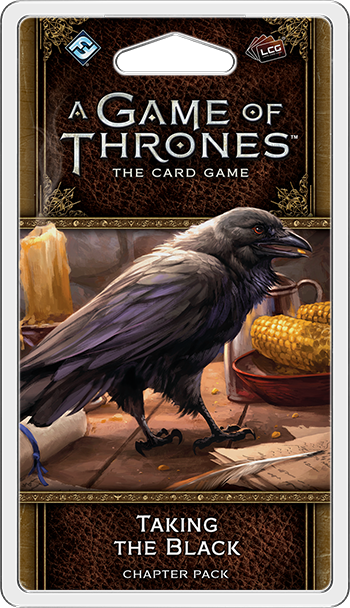 You can take your place at the very beginning of the story with Taking the Black, the first Chapter Pack in the Westeros cycle for A Game of Thrones: The Card Game. As part of the Westeros cycle, Taking the Black explores the first chapters of A Game of Thrones with iconic characters like Renly Baratheon, the Hound, and Maester Luwin entering the game for the first time. In Taking the Black, each faction begins its journey through A Game of Thrones towards the Iron Throne! For more on Taking the Black and the entire Westeros cycle, we turn to the designer of A Game of Thrones: The Card Game, Nate French. As this is the first cycle, our primary design goal was to expand the possibilities of the Core Set without adding additional rules to the game. 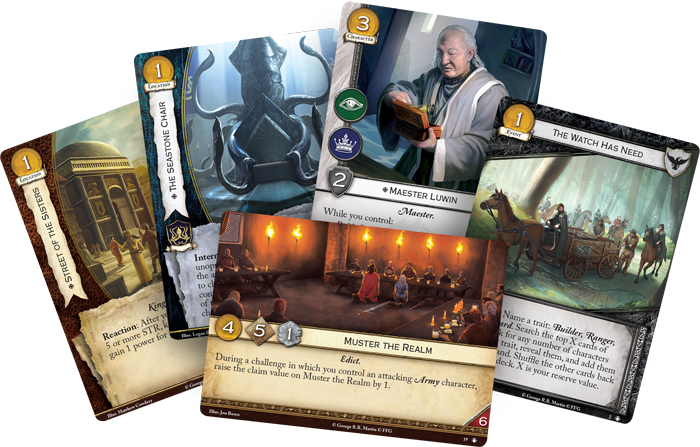 At a very basic level, there are two types of cards that you’ll find in the Westeros cycle: cards that easily slot into a core deck, and cards that pull a player’s understanding of a core theme in a new direction. Another important design goal of the set was to rapidly increase the number of plot cards in the environment. Constructing and piloting a plot deck is one of the most enjoyable aspects of A Game of Thrones, and we felt that investing heavily in new plot cards would rapidly increase the strategic scope of the game. This cycle introduces eighteen new plots to the game, including a loyal plot for each faction. Each of these loyal plots – like For the Watch! – supports its faction’s core strategies, inviting players to further embrace each faction’s unique playstyle. Working on this set and the young, second edition card pool was a lot of fun, and I’m looking forward to seeing these cards influence the early metagame. 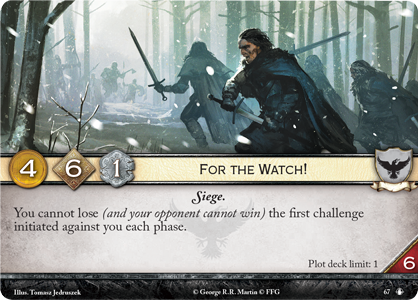 Recently, we previewed the Night’s Watch faction in the second edition of A Game of Thrones: The Card Game. More than any other faction, the Night’s Watch relies on defense. 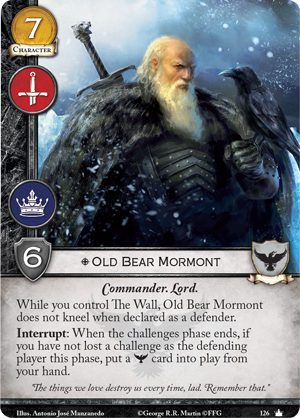 The Wall (Core Set, 137) grants additional power when you oppose every challenge, and powerful characters like Old Bear Mormont (Core Set, 126) can bring other Night’s Watch characters into play, provided you haven’t lost a challenge as the defending player. The exception to the Watch’s focus on defense are its Rangers. They walk the lands beyond the Wall, gathering information and scouting for possible threats to the Watch. 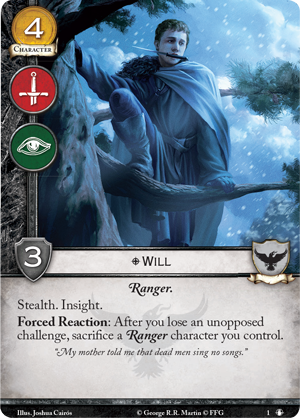 In the prologue of A Game of Thrones, the first characters you encounter belong to the Night’s Watch, so it only makes sense that the first character you see in Taking the Black is one of these Night’s Watch Rangers: Will (Taking the Black, 1). Will bears both the military and intrigue challenge icons, as well as two important keywords. Stealth allows Will to choose an opponent’s character who cannot defend the challenge, and insight invites you to draw a card if you win the challenge. This combination of challenge icons and keywords can be formidable, especially for only four gold, but Will is not without drawbacks. The Rangers of the Watch accomplish nothing if enemies still get past the Wall. Because of this, Will also bears a Forced Reaction: “After you lose an unopposed challenge, sacrifice a Ranger character you control.” In other words, as long as you have a defender to oppose every challenge, Will is free to sneak by your opponent’s characters and learn their plans. As soon as enemies begin to slip by you, however, Will can quickly become a liability that must be sacrificed for the greater good. 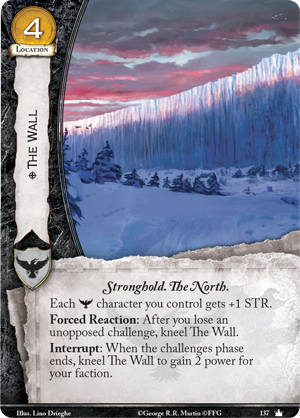 Will isn’t the only card the Night’s Watch gains in Taking the Black. These defenders of Westeros also gain an event that allows you to gather new recruits wherever you find them. You can swell your hand with new brothers for the Night’s Watch by playing The Watch Has Need (Taking the Black, 2). 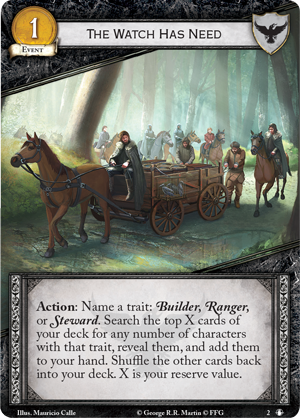 Playing this event allows you to name a trait: either Ranger, Steward, or Builder. Then, you may search a number of cards from the top of your deck equal to your plot’s reserve value, and add all cards that bear the named trait to you hand. In many ways, playing The Watch Has Need can help you shore up any weaknesses in the strengths of the Night’s Watch. Each of the three branches of the Night’s Watch – Rangers, Stewards, and Builders – loosely corresponds to the three challenge icons: military, intrigue, and power. Because of this, if you desperately need more characters with the intrigue icon, you may name Steward, whereas if you’re short on military icons, you may choose Ranger. It’s also important to consider the reserve of your plot when you play the card. 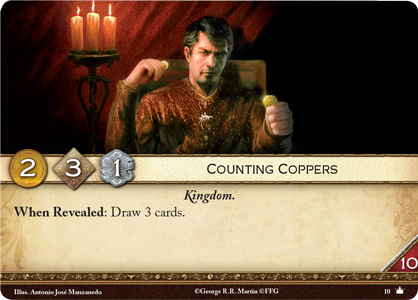 Counting Coppers (Core Set, 10) allows you to search ten cards for your recruits, but offers little gold to play them. 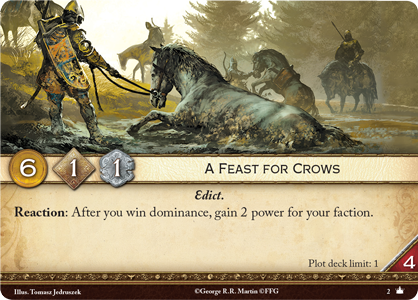 A Feast for Crows (Core Set, 2), on the other hand, only allows you to search four cards, but gives you enough gold to play even the most expensive characters. Look for Taking the Black at your local retailer in the fourth quarter of 2015.